I am delighted to find that my enthusiasm for the work is only reinforced by this superb new recording, given by the Norrköping Orchestra who gave the world première of the piece with the same conductor who had commissioned the work. In Cardiff Martyn Brabbins obtained an even more glowing performance from the BBC National Orchestra of Wales, with their richer and more saturated string sound and darker sonorities; but, enhanced by the splendid BIS recording, the Norrköping players are by no means outclassed. The work remains as impressive as it did on first acquaintance. One wonders why we have had to wait so long for this performance to be released on CD. The other two works on this disc are both considerably earlier pieces, but serve to flesh out our knowledge of Pickard’s developing style. The Piano Concerto begins as a very percussive piece indeed, but it is far from devoid of thematic interest and sparkles with life especially in the enthusiastic performance given us here by Fredrik Ullén, again with Brabbins and his Norrköping orchestra. Again one might welcome a rather richer string sound; but the almost Baxian melody which launches the second movement Passacaglia is phrased with warmth and affection as well as nicely sustained tone. The use of ‘bent’ notes on the tubular bells towards the end of this movement (track 2, 8.00) is an intriguing effect. After this the finale reverts to the more percussive style of the opening, and this makes for a sparkling conclusion. The earliest piece here, Sea-change, was written for a student orchestra at Bangor University, where Pickard studied under William Mathias, but it makes little concession to the abilities of student players although the composer in his informative booklet notes considers it “less technically demanding than the other, more complicated, pieces I was writing around that time.” In its depiction of the sea it anticipates his later orchestral works The flight of Icarus and Channel firing, both of which have already been recorded by the Norrköping forces on an earlier BIS release. 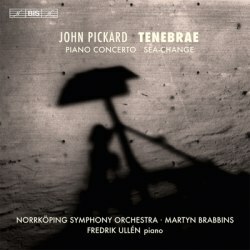 Sea-change is like thePiano Concerto a rather percussive work, but towards the end (at around 15.00) it develops into something more with a grandiose theme thundered out by the full orchestra which draws the attention. Both the Piano Concerto and Sea-change are valuable additions to the catalogue in their own right, butTenebrae is something else again – a work of towering genius which deserves to be heard by anyone with the slightest interest in modern music. One looks forward with anticipation to future performances – how about an outing at the Proms?. In the meantime, this CD is well worth a close listen.